Campaigner Mike Harding in Blowing up the Dales. They are some of quirks, customs, challenges and traditions that make rural life in Yorkshire so special. And now, for the first time, films revealing the hidden histories and forgotten stories of the region’s rural past have been digitised for a new generation as part of the £15m Lottery-funded Britain on Film project. Yorkshire Film Archive (YFA) was one of a host of regional and television archives that dusted off reels of films, many unseen for decades, as part of the BFI project. It first made some of its 50,000 strong archive available last summer, when thousands of films from around the country were made available of the BFI player. That focussed on films portraying Britain’s cities and urban areas, but now the attention has turned to films showcasing our rural heritage - and Yorkshire Film Archive were tasked with trying to represent the diverse lifestyle, industry and traditions of God’s Own Country on film. But it was not so much of a challenge, as the archive revealed a rich and sprawling collection of rural films - including some that have special resonance today. In the Yorkshire Television documentary Blowing Up The Dales, from 1987, impassioned campaigners like Mike Harding tell of their quest to protect the countryside from quarrying, in a film that draws parallels to today’s fracking debate. Commuters can find out more about Stott Hill Farm, which famously sits amid the buzz of traffic in the middle of M62 in the 1987 film The Farm on The Motorway. But for the YFA’s archive manager Graham Relton, it is the films that are about people that really stand out, like The Pancake Day Scramble, filmed in a school in Swinton, Rotherham in 1960, and Bringing in the Coal, from 1980, which recorded the 17th world coal carrying contest in Gawthorpe, West Yorkshire. He said: “In the Scramble there was literally no health and safety. A dinner lady throws a pancake into the air and children pile in, elbows sharpened, to try and grab a piece to win some sweets. It’s one of those quirky traditions from our past that you’d never see today. 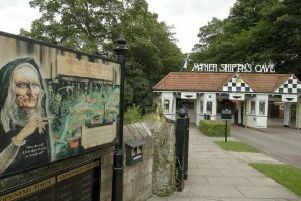 It shows instantly recognisable sights such as Fountains Abbey and the Spa Baths, at time when bather’s changing huts could be found on the banks of the River Ure. The copy in the archive was so old, that digitising it as part of the project was a chance to ensure it will be conserved for future generations. Now more than 5,000 films have been digitised by the Britain on Film project, including more than 750 on Rural Life dating from 1900 to 1999. To view the films, visit player.bfi.org.uk/britain-on-film. A SERIES of screenings, shows and events will take place in venues including film festivals and village halls as part of the project. The ‘Britain of Film: Rural’ touring programme will launch in Yorkshire on June 27 at Grassington Festival, followed by events from July to October. While many are yet to be announced, it will also include a special event at Beverley’s Parkway cinema on July 22, which will be followed by an exhibition at the town’s Guildhall opening the following day and running all summer. Full details of the screenings, which are supported by Film Hub North, will be available on www.yorkshirefilmarchive.com where you can search the collection of more than 50,000 titles.